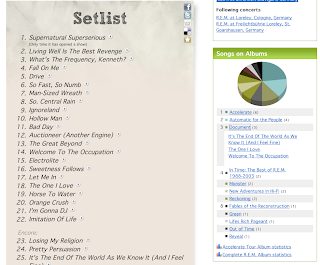 Setlist.fm Blog: Albums now online! It has been the top feature request for well over a year - but now it's finally online: Albums! If you ever wondered which songs from which albums were played on a concert - or will be played on a tour or how's the total distribution of all albums, then you will love this new stuff. You might find out that the albums of your favourite artist have not yet been imported. Just give it a little time - over the next weeks, every artist's albums should be available. 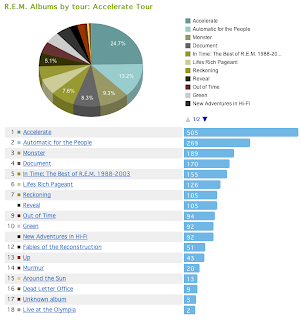 The pie and column charts of the song statistics were also replaced with the interactive charts that are used for the album stats. Yeah, that's cool! So many R.E.M. Albums, thats amazing!